CHICAGO–The U.S. Department of State’s Bureau of Educational and Cultural Affairs recently recognized the School of the Art Institute of Chicago (SAIC) as one of two specialized institutions in the nation with the most U.S. Fulbright students. Two SAIC students received Fulbright awards for 2016–17, and since 2002, 34 students have represented SAIC as U.S. student Fulbright fellows. SAIC joins the University of Chicago and Northwestern University as the only Illinois colleges to be included on the list. As a 2016–17 student Fulbright recipient, Nicholas Jackson (BFA 2011) researched perspectives and experiences surrounding the EuroMaidan protests in Ukraine, which began in 2013. Jackson is interviewing Ukrainians of differing perspectives and backgrounds to better understand the wave of demonstrations and civil unrest that demanded closer European integration and the end to government corruption. These accounts will be edited and illustrated in a documentary comic, as well as exhibited and presented in an online archive. As a 2016–17 U.S. student Fulbright fellow, Sarah Kristen Williams (MFA 2014) is studying music composition in Berlin, Germany. Combining her experience in visual art and love of music, she is developing a system for composing a score to accompany “Stille Opera,” her series of narrative sculptures organized as opera. 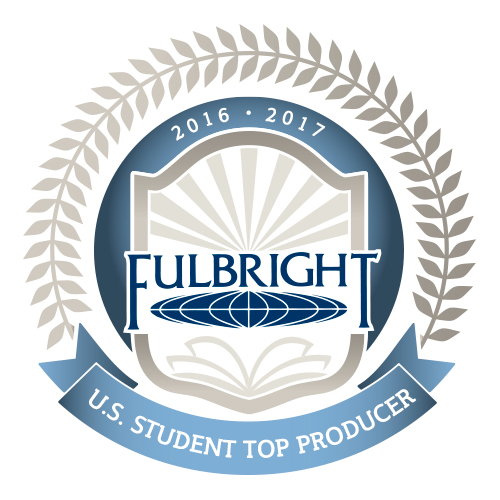 The Fulbright Program is the U.S. government’s flagship international educational exchange program. Top producing institutions are highlighted annually in The Chronicle of Higher Education. Since its inception in 1946, the Fulbright Program has provided more than 370,000 participants–chosen for their academic merit and leadership potential–with the opportunity to exchange ideas and contribute to finding solutions to shared international concerns. More than 1,900 U.S. students, artists and young professionals in more than 100 different fields of study are offered Fulbright Program grants to study, teach English and conduct research annually. The Fulbright U.S. Student Program operates in more than 140 countries throughout the world. The Fulbright Program also awards grants to U.S. scholars, teachers and faculty to con-duct research and teach overseas. In addition, approximately 4,000 new foreign Fulbright students and scholars come to the U.S. annually to study for graduate degrees, conduct research and teach foreign languages.